A ‘terrestrial’ orchid literally means an orchid that grows in the ground. There are approximately 1200 native orchid species in Australia: more than half of these are terrestrials and most are uniquely Australian. Terrestrial orchids have tubers. In comparison to other plants, they have few roots because they live in association with fungi, called mycorrhizal fungi, which gather nutrients for the orchid. 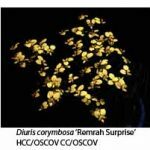 Some of these orchids are easy to grow, while some are difficult and others are impossible because of a special symbiotic relationship that they have with mycorrhizal fungi. Growth Cycle. Almost all terrestrials are deciduous and have a growth cycle in which they spend 6-8 months growing in cool, moist conditions and 4-6 months resting as dormant underground tubers during the hot, dry summer. This is their unique way of surviving Australia’s harsh dry summer conditions. New tubers are produced in winter-spring and after flowering the plant dies down, the tubers becoming dormant until the next autumnal rains. Most terrestrial orchids flower in spring but there are some earlier flowering species such as the autumn flowering Pterostylis (greenhood orchids). Growing terrestrials from tubers. I grow a few terrestrial orchids and love the sight of a potful of them in flower. The cultural comments below refer to my growing practices in my conditions – methods may vary from grower to grower. Tubers can be potted in December/January -1 do mine in January when I am on holidays and have time to do it. I use black plastic pots – squat pots are good because of their extra drainage holes. Before I put the potting mixture into the pot, I place a circle of shade-cloth in the bottom of the pot to cover the drainage holes. The cloth prevents the sandy potting mixture from leaking out and also deters larger slaters and earwigs from sneaking in! I use the basic potting mixture recommended by ANOS which comprises two parts of coarse sand, one part of mountain soil, one part of buzzer chips (not treated pine, Western Red Cedar or chipboard), one part of leaf mould (partially rotted down leaves found under trees) and approximately one dessertspoonful of Blood and Bone per 9 litres of mix. Fill the pot about two-thirds full with the mix, and arrange the tubers with their growing ‘eye’ facing upwards. The tubers should be about 30 mm below the final level of the mix. Cover the tubers with more mix and firm it down. Top the mix with about 10 mm of chopped pine or Casuarina (sheoak) needles. The chopped needles form a mat and prevent erosion of the mix when watering. It also keeps the leaves above the mix so that they dry off quickly, thus lessening the chance of leaf rot. The juvenile plants find their way through this mat without difficulty. Note: When re-potting tubers the following year, use equal quantities of new mix and last year’s mix, so as to transfers necessary mycorrhizal fungi to the new mix. Water the pots well and keep them shaded. Allow the pots to dry out between very light sprinklings until about the end of February (you don’t want the tubers to rot). Then place the pots in their growing position in the orchid house -1 stand mine on paving bricks on the floor. 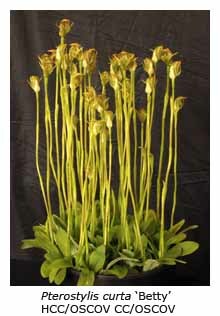 Diuris like a brighter position than Pterostylis, and Corybas like more shade. Water them more regularly now, gently filling the pot to the rim and then allowing the water to soak in. In autumn each tuber sends up a shoot to the surface and leaves grow quickly in late autumn. 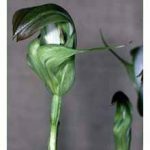 Pterostylis are the first to appear (March), then Diuris and finally Corybas (June). Terrestrial orchids don’t cope well with fertiliser (they can be burnt and even die), although Pterostylis and Diuris are tougher and can cope with a very weak solution (I use Aquasol®) when the leaves first appear. After flowering, the plants begin to die down in or about November. I stop watering them, remove the pots from the orchid house and put them where they won’t get water (as in their natural growing conditions) – mine go under my decking because they are conveniently out of the way. I do give the pots a little sprinkle of water occasionally every week or two. Too much water will rot the tubers – so don’t overdo it! Pests. The worst pests are slugs and snails – they love to chomp on a stem or bud just when the plants are ready for the Spring Show! Snail pellets help (Baysol® works best for me). Scatter them around the pots, but preferably not in them. Remember that snail bait is poisonous to pets! Placing the pots on rough paving bricks also helps to deter snails and slugs. Slaters, and occasionally earwigs, find their way into the bottom of the pot if I don’t put a piece of shade cloth inside the pot before adding the mix. Infrequently, near flowering time, tiny green caterpillars appear and wreak havoc with the stems. Pyrethum spray ‘fixes’ them, but nothing can fix the damaged stems! Some Recommendations. Beginners should choose species that are hardy and multiply well. I find colony-forming Pterostylis the easiest to grow, particularly Pterostylis curta, P. pedunculata, P. nutans, P. concinna and P. baptistii, which has large impressive flowers. Hybrids show vigour, and I grow Pterostylis Cutie ‘Harold’s Pride’ which makes a nice show. Sales at spring orchid shows and sales tables at club meetings. Pots of plants are available. Nesbitts Orchids (Les Nesbitt). Tubers, bare-root plants and flasks are available. PO Box 72, Walkerville, SA 5081. Phone: (08) 8261. Les Nesbitt is a renowned grower and hybridiser of native terrestrials as well as a senior judge in South Australia. 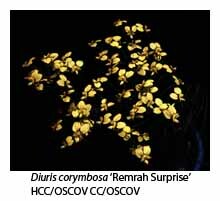 He puts out a catalogue twice a year, so get on his mailing list if you are interested in terrestrial orchids. 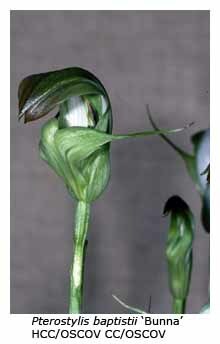 He has quite a range, particularly of Pterostylis species and hybrids. 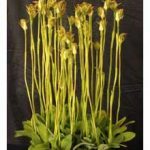 Join the Australasian Native Orchid Society (ANOS. Do NOT remove terrestrial orchids from the wild.